Reading and share top 1612 famous quotes and sayings about World Love by famous authors and people. Browse top 1612 famous quotes and sayings about World Love by most favorite authors. 1. "It makes a world of difference to know that God loved you enough to send His only begotten Son to suffer and die for you. Suddenly our lives and sufferings aren't meanigless accident, but part of God's loving plan for us. And our acceptance of that plan becomes our own loving response. It is the difference between being in love and living a dreary existence!" 2. "The glory, it has passed, the great days, they have gone. There is no place in the world now for our kind, not unless we will take it, and take it with much blood. There are those who will do so, but me, I find I love my fellow man too much and I cannot end his life, not even to restore what has been lost. But without great ruthlessness, glory fades and strength is gone." 4. "A first child is your own best foot forward, and how you do cheer those little feet as they strike out. You examine every turn of flesh for precocity, and crow it to the world. But the last one: the baby who trails her scent like a flag of surrender through your life when there will be no more coming after--oh, that' s love by a different name." 5. "God cloaks himself in invisibility and leaves the world to guess, hope, and kill over his identity and existence? This is love?" 6. "If God's love encompasses the whole world and if everyone who does not believe in him will perish, then surely this question needs to be asked: When, after two thousand years, does God's plan kick in for the billion people he 'so loves' in China? Or for the 840 million in India? Or the millions in Japan, Afghanistan, Siberia, Egypt, Burma ·.. and on and on?Why would a God who 'so loved the world' reveal his message only to a tiny minority of the people on earth, leaving the majority in ignorance? Is it possible to believe that the Father of all Mankind would select as his Chosen People a small Middle Eastern nation, Israel, reveal His will exclusively to them, fight alongside them in their battles to survive, and only after their failure to reach out to any other group, update His plan for the world's salvation by sending His 'only begotten son,' not to the world but, once again, exclusively to Israel?" 7. "He remembered Alejandra and the sadness he'd first seen in the slope of her shoulders which he'd presumed to understand and of which he knew nothing and he felt a loneliness he'd not known since he was a child and he felt wholly alien to the world although he loved it still. He thought that in the beauty of the world were hid a secret. He thought the world's heart beat at some terrible cost and that the world's pain and it's beauty moved in a relationship of diverging equity and that in this headlong deficit the blood of multitudes might ultimately be exacted for he vision of a single flower." 8. "Students never appreciate their teachers while they are learning. It is only later, when they know more of the world, that they understand how indebted they are to those who instructed them. Good teachers expect no praise or love from the young. They wait for it, and in time, it comes." 9. "We can't stop the world,but there's so much more that we could doYou can't stop this girlfrom falling more in love with youYou said nobody has to know Give us time to grow, and take it slowbut I'd stop the world if it finally let us be aloneLet us be alone oooo ohhh oh"
10. "Our Father, who has set a restlessness in our hearts and made us all seekers after that which we can never fully find, forbid us to be satisfied with what we make of life. Draw us from base content and set our eyes on far-off goals. Keep us at tasks too hard for us that we may be driven to Thee for strength. Deliver us from fretfulness and self-pitying; make us sure of the good we cannot see and of the hidden good in the world. Open our eyes to simple beauty all around us and our hearts to the loveliness men hide from us because we do not try to understand them. Save us from ourselves and show us a vision of a world made new." 11. "Cruelty and wrong are not the greatest forces in the world. There is nothing eternal in them. Only love is eternal." 12. "Is it love to worship a saint in heaven, whom you dare not touch, who hovers above you like a cloud, which floats away from you even as you gaze? To love is to feel one being in the world at one with us, our equal in sin as well as in virtue. To love, for us men, is to clasp one woman with our arms, feeling that she lives and breathes just as we do, suffers as we do, thinks with us, loves with us, and, above all, sins with us. Your mock saint who stands in a niche is not a woman if she have not suffered, still less a woman if she have not sinned. Fall at the feet of your idol an you wish, but drag her down to your level after that- the only level she should ever reach, that of your heart." 13. "And nevertheless, when they watched him leave the house, this man they themselves had urged to conquer the world, then they were the ones left with the terror that he would never return. That was their life. Love, if it existed, was something separate: another life." 14. "We must declare ourselves, become known; allow the world to discover this subterranean life of ours which connects kings and farm boys, artists and clerks. Let them see that the important thing is not the object of love, but the emotion itself." 15. "Yes, our goal as Christians should be to do away with the things in our world that keep people from knowing the love and freedom of Christ. Equally, and maybe more so, our goal should be noticing and doing away with the things on our own lives that keep people from understanding Christ as well. After all, don't the systematic injustices usually grow from the individual ones?" 16. "The Purpose of Philosophy is to fall in Love. To strip the world of all its clothes, and fall in Love with it as it stand before you completely naked." 17. "I nodded. A man's world. But what did it mean? That men whistled and stared and yelled things at you, and you had to take it, or you get raped or beat up? A man's world meant places men could go but not women. It meant they had more money,and didn't have kids, not the way women did, to look after every second. And it meant that women loved them more than they loved the women, that they could want something with all their hearts, and then not." 18. "[He] fell right into the oldest conviction in the world-- that the girl you are in love with can't possibly be anything but true and honest." 19. "I sit down on the bed, cradling her little head against my shoulder, inhaling her sweet baby scent. Someday she'll get older, and the world will start having its way with her. She'll throw temper tantrums, she'll need speech therapy, she'll grow breasts and have pimples, she'll fight with her parents, she'll worry about her weight, she'll put out, she'll have her heart broken, she'll be happy, she'll be lonely, she'll be complicated, she'll be confused, she'll be depressed, she'll fall in love and get married, and she'll have a baby of her own. But right now she is pure and undiminished and beautiful." 20. "Ain't all buttons and charts, little albatross. Know what the first rule of flying is? Well I s'pose you do, since you already know what I'm 'bout to say.I do. But I like to hear you say it.Love. Can know all the math in the 'verse but take a boat in the air that you don't love? She'll shake you off just as sure as a turn in the worlds. Love keeps her in the air when she oughta fall down...tell you she's hurtin' 'fore she keens...makes her a home." 21. "[He] has always believed in me. Even when I didn't believe in myself. Even when I was at my worst, he saw only the best in me, and he was determined for me to see it too. Now I know for certain that Mabel was right. There's nothing in the world like having someone love you for who you really are. Looking at your heavy baggage and leaning down to whisper in your ear, "You're perfect." 22. "I did not know where I belonged or if there was a place on earth for children who had broken hearts and shattered trustI could not fathom a place where those who were not loved would feel safe from the hands of predators and the leering eyes of those who'd lost a love for innocenceI walked close to walls and never slept, held my breath during long nights of ticking clocks and creaking floors hoping that the monsters in the closet would be too tired to whisper secrets worse than nightmaresuntil a fragment of Truth unlocked the door to a kingdom with air so rarified and pure that demons cannot breathe there and monsters wither in the lightyou do not live in the world it promised you live in the space where God and men do meet, you live in a kingdom undivided, inviolate, a place where you can close your eyes and rest your hopes upon His Love... in this place there is only peace...rest sweet child rest,rest, rest..."
23. "But greatness is in the act of creation and not necessarily in the finished product. Creating is the yin to the yang of our consumption and the doorway to beauty that we all want to walk through. Creating is how I tell the world I love it." I"
24. "All were happy -- plants, birds, insects and children. But grown-up people -- adult men and women -- never left off cheating and tormenting themselves and one another. It was not this spring morning which they considered sacred and important, not the beauty of God's world, given to all creatures to enjoy -- a beauty which inclines the heart to peace, to harmony and to love." 25. "It is strange,' he said at last. 'I had longed to enter the world of men. Now I see it filled with sorrow, with cruelty and treachery, with those who would destroy all around them.' 'Yet, enter it you must,' Gwydion answered, 'for it is a destiny laid on each of us. True, you have seen these things. But there are equal parts of love and joy." 26. "238. I want you to know, if you ever read this, there was a time when I would rather have had you by my side than any one of these words; I would rather have had you by my side than all the blue in the world.239. But now you are talking as if love were a consolation. Simone Weil warned otherwise. "Love is not consolation," she wrote. "It is light."240. All right then, let me try to rephrase. When I was alive, I aimed to be a student not of longing but of light." 27. "We live in a complex world. There are many forces calling out, ‘Love me.' A sure way to set our guidelines for that which we choose to serve and learn to love is to follow the admonition of Joshua: ‘As for me and my house, we will serve the Lord." 28. 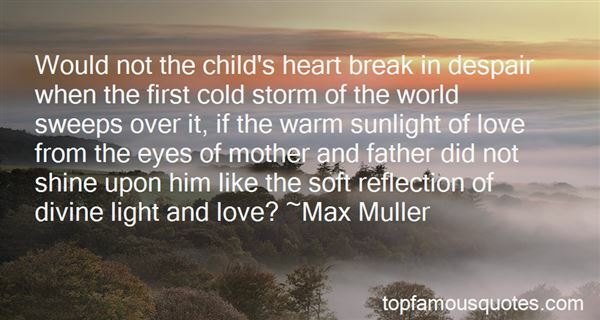 "Would not the child's heart break in despair when the first cold storm of the world sweeps over it, if the warm sunlight of love from the eyes of mother and father did not shine upon him like the soft reflection of divine light and love?" 29. "I want Dubai to be a place where everybody from all over the world meets each other, don't think of fighting or hate, just love it, enjoy their sport, and that's it." 30. 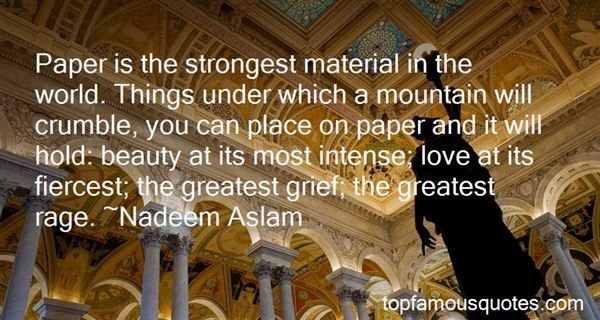 "Paper is the strongest material in the world. Things under which a mountain will crumble, you can place on paper and it will hold: beauty at its most intense; love at its fiercest; the greatest grief; the greatest rage." 31. "Every time I read to her, it was like I was courting her, because sometimes, just sometimes, she would fall in love with me again, just like she had a long time ago. And that's the most wonderful feeling in the world. How many people are ever given that chance? To have someone you love fall in love with you over and over?" 32. "What happened instead was that the tree fell in love with him and began to murmur fondly of the joy to be found in the eternal embrace of a red oak. "Always, always," it sighed, "faithful beyond any man's deserving. I will keep the color of your eyes when no other in the world remembers your name. There is no immortality but a tree's love." 33. "We have no reason to harbor any mistrust against our world, for it is not against us. If it has terrors, they are our terrors; if it has abysses, these abysses belong to us; if there are dangers, we must try to love them. And if only we arrange our life in accordance with the principle which tells us that we must always trust in the difficult, then what now appears to us as the most alien will become our most intimate and trusted experience." 34. "He's changing. Every day more remote, protected, distant. He builds fests now for the soulmate he hasn't found, bricking wall and maze and mountain fortress, dares her to find him at the hidden center of them all Here's an A in self-protection from the one in the world he might love and who might someday love him." 35. "RELUCTANCEOut through the fields and the woods And over the walls I have wended;I have climbed the hills of view And looked at the world, and descended;I have come by the highway home, And lo, it is ended.The leaves are all dead on the ground, Save those that the oak is keepingTo ravel them one by one And let them go scraping and creepingOut over the crusted snow, When others are sleeping.And the dead leaves lie huddled and still, No longer blown hither and thither;The last lone aster is gone; The flowers of the witch hazel wither;The heart is still aching to seek, But the feet question ‘Whither? 'Ah, when to the heart of man Was it ever less than a treasonTo go with the drift of things, To yield with a grace to reason,And bow and accept the end Of a love or a season?" 36. "Money rules the world, and doubtless also, here and there, the bit of love within it, and when love turns to hate, one remembers unpaid board." 37. "For death is always in the shadow of the delight of love. In faint adumbration there is present the dread, haunting question, Will this new relationship destroy us?...The world is annihilated; how can we know whether it will ever be built up again? We give, and give up, our own center; how shall we know that we will get it back?...This...has something in common with the ecstasy of the mystic in his union with God: just as he can never be //sure// God is there, so love carries us to that intensity of consciousness in which we no longer have any guarantee of security." 38. "This World is filled with Demons (Humans) who love lying to each other. If they find a true man they will stab in back and act like innocent." 39. "But she was the only woman--the only one in the entire world--Terrible loved... If she lost that, she'd lose what made her special. She'd be happy, yes. She'd find some other man eventually, probably, and maybe he'd be good enough. She'd look different, act different. Be different. She would never again feel that, though, the feeling of being the most special woman in the entire world, of knowing no one else could possibly be as happy as she was because they honestly didn't know how lucky they were, how truly and amazingly lucky. Because they didn't feel like they'd been lost their entire lives and they'd finally found home." 40. "It's the most maddening, beautiful, magical, horrible, painful, wonderful joyous thing in the world, love"
41. "Prayer does not blind us to the world, but it transforms our vision of the world, and makes us see it, all men, and all the history of mankind, in the light of God. To pray 'in spirit and in truth' enables us to enter into contact with that infinite love, that inscrutable freedom which is at work behind the complexities and the intricacies of human existence. This does not mean fabricating for ourselves pious rationalizations to explain everything that happens. It involves no surreptitious manipulation of the hard truths of life." 42. "We have to start from the ground up and reconsider what education is. In my language, I'd like to see us educate the soul, and not just the mind. The result would be a person who could be in the world creatively, make good friendships, live in a place he loved, do work that is rewarding, and make a contribution to the community. People say that the word "educate" means to "draw out" a person's potential. But I like the "duc" - part in the middle of it. To be educated is to become a duke, a leader, a person of stature and color, a presence and a character." 43. "Ultimate reality is a community of persons who know and love one another. That is what the universe, God, history, and life is all about. If you favor money, power, and accomplishment over human relationships, you will dash yourself on the rocks of reality [...][it is] impossible [...] to stay fully human if you refuse the cost of forgiveness, the substitutional exchange of love, and the confinements of community.[...] We believe the world was made by a God who is a community of persons who have loved each other for all eternity. You were made for mutually self-giving, other directed love. Self-centeredness destroys the fabric of what God has made." 44. "If humanity can describe God in one word: LOVE? Then how can the world continue to hurt and destroy each other then believe they walk in his light and favour. To live love means to be ones keeper...not ones judge!" 45. "Sometimes I often wonder: What would happen in our world, if all of humanity's children threw a revolution of love & kindness instead of war, hate & violence?" 46. "A wife! No one else could love a man who had been trampled on by iron feet. She would wash his feet after he had been spat on; she would comb his tangled hair; she would look into his embittered eyes. The more lacerated his soul, the more revolting and contemptible he became to the world, the more she would love him. She would run after a truck; she would wait in queues on Kuznetsky Most, or even by the camp boundary fence, desperate to hand over a few sweets or an onion; she would bake shortbread for him on an oil stove; she would give years of her life just to be able to see him for half an hour... Not every woman you sleep with can be called a wife." 47. "The thing is, I can't love her, not in the real world. Because this would be degrading to me. To love someone who despises you, and she just might. You should see her eyes on me sometimes. Plus she's not even a mother anymore, she's just a planet with a face. Da at least has hands." 49. "I take literally the statement in the Gospel of John that God loves the world. I believe that the world was created and approved by love, that it subsists, coheres, and endures by love, and that, insofar as it is redeemable, it can be redeemed only by love. I believe that divine love, incarnate and indwelling in the world, summons the world always toward wholeness, which ultimately is reconciliation and atonement with God." 50. "I have always swung back and forth between alienation and relatedness. As a child, I would run away from the beatings, from the obscene words, and always knew that if I could run far enough, then any leaf, any insect, any bird, any breeze could bring me to my true home. I knew I did not belong among people. Whatever they hated about me was a human thing; the nonhuman world has always loved me. I can't remember when it was otherwise. But I have been emotionally crippled by this. There is nothing romantic about being young and angry, or even about turning that anger into art. I go through the motions of living in society, but never feel a part of it. When my family threw me away, every human on earth did likewise." Perhaps not one religion contains all of the truth of the world. Perhaps every religion contains fragments of the truth, and it is our responsibility to identify those fragments and piece them together."